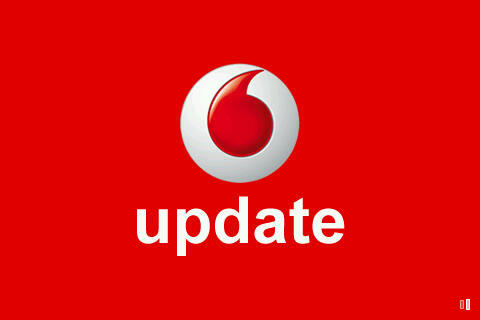 I’ve been using Vodafone Update for about a day now and so far it’s shaping up to be a pretty decent app. Graphically it is a very clean and well laid out app. 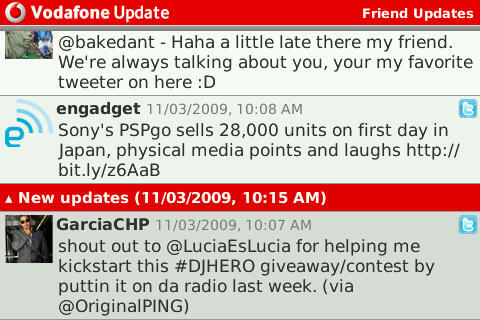 It seems to be a combination of both Socialscope and Upbertwitter with its looks. 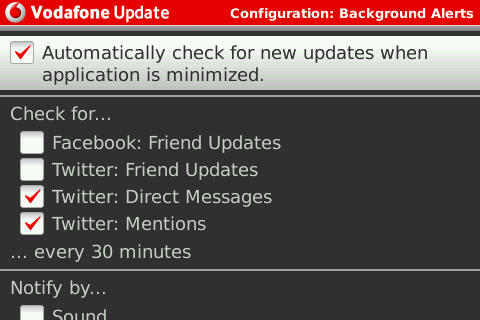 The app is worth a try for anyone who updates on Twitter frequently with thier BlackBerry or any other platform Vodafone Update supports. This is what the timeline screen looks like. Very clean. Profile images show up nice and clear. Tweets that you send are highlighted in purple while Mentions are highlighted in blue. The dark gray highlight is what you are currently on. Color contrast is very good and makes it easy to view at a glance. Interesting note about the timeline screen. 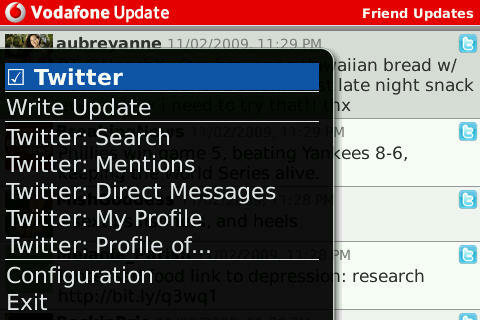 The timeline never really updates itself automatically. There is an update button that your press and it brings up all the latest updates since the last time it updated. 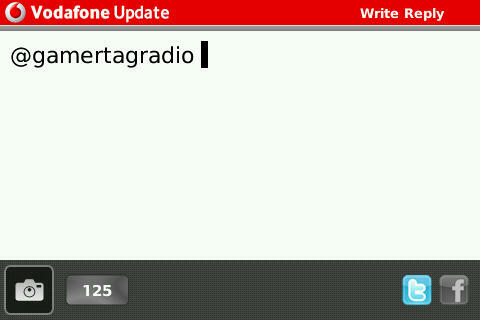 As you can see by the red bar, it tells you when you did your last update and everything above it is what is new. It’s a nice touch so you can see what you have already read and what you haven’t. You can however have the app download updates automatically, but that is another screen I will show later. Clicking on a tweet brings up this screen which shows the name of the person and the tweet. 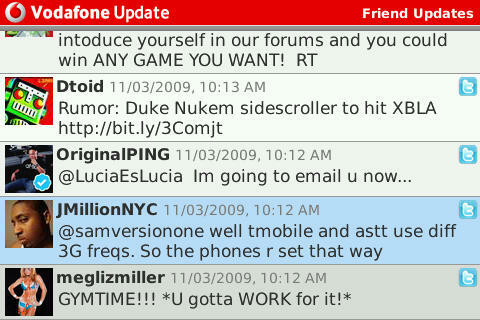 This app works mostly with keyboard shortcuts so to reply to the tweet, you would press “m” on the keyboard. From the update screen, you can reply as normal, add a twitpic which would choose from either your gallery or take a live picture with your camera. You can also choose to send it to Twitter, Facebook, or both. 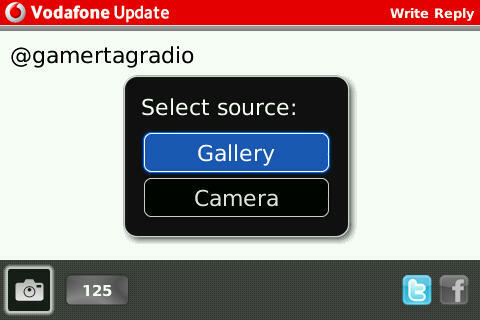 Right now, Vodafone Update only has support for Twitpic. Maybe this will change in the future. This is the profile information screen. It has lots of information in such a small amount of space. 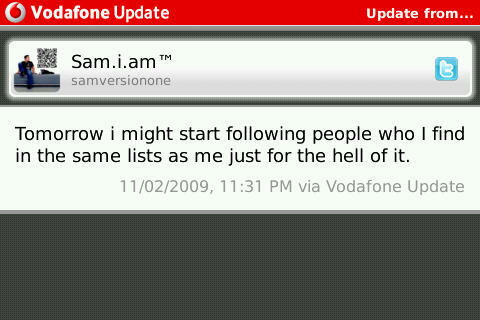 From here you can follow, unfollow, reply, DM and view all their most recent tweets. What you can not do is view who they are following or who their followers are. Hopefully that too will get added in a future update. 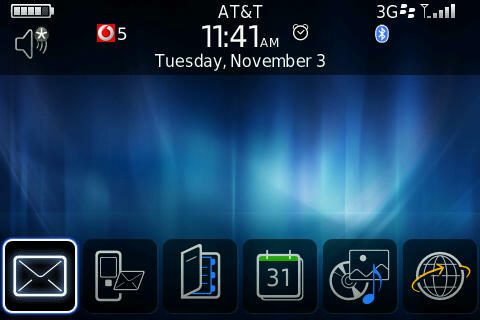 As you can see from the main BlackBerry screen, the Vodafone Update icon stays in the notification area as long as the program is in the background. It does not disappear. It can be a bit confusing at first but you get used to it. Please note however that the app for some reason does not flash an LED notification when new notifications arrive. You can only set silent, vibration, or tone notifications. I hope they add a LED notification in future releases. After seeing that you have new updates available, going to the app brings up this screen. 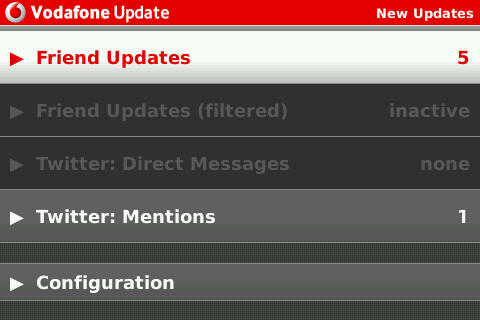 It shows the number of updates available for each category such as mentions, direct messages, and Friend updates. It is a fairly useful screen to see what updates you have. These are the configuration screens. Pretty self explanatory. Everything is laid out nicely and the options are clearly marked. 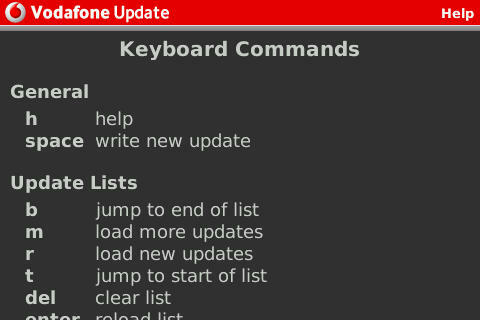 Pressing “H” on the keypad at any screen brings up a help menu that shows all the keyboard shortcuts you can use. They are fairly easy to remember. 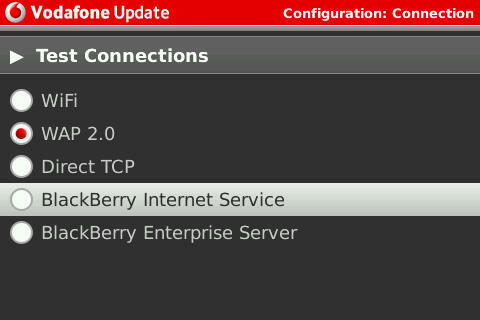 Pressing the BlackBerry button brings up this menu item. As you can see, it only shows items that belong to this app. Unlike some other apps, this is short and to the point. 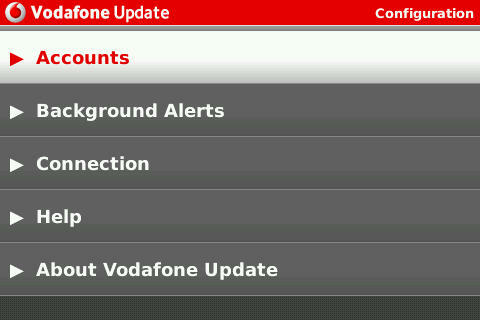 That is pretty much all the screens available in Vodafone Update. As you can see, the app is pretty straight forward with very little necessaries. 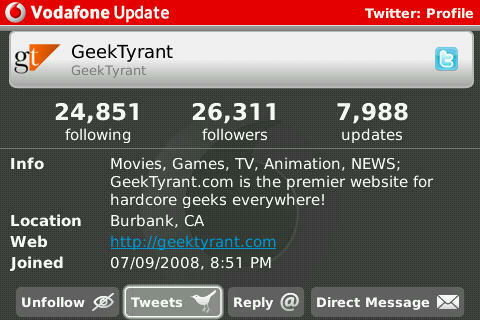 I wish there were a few more options in place such as being able to see images from Twitpic inline with updates or being able to upload an image directly to Twitpic straight from the BlackBerry’s media gallery without having to first open up Vodafone Update, but I will say that what this app does do, it does it very well. UPDATE: Version 2.0.1 I was informed was released today. After downloading this, I discovered that they have added more connection types under the connection settings. 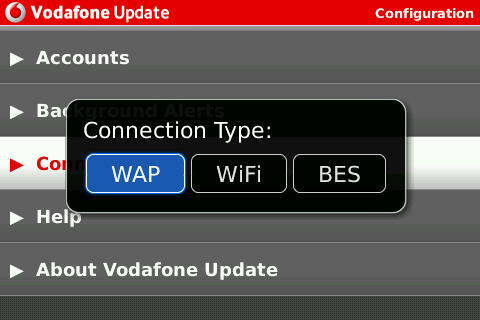 You can now also choose to connect via BIS or Direct TCP. Disclaimer: I have not been paid or asked to do a review for Loopt. This review is done by myself and to inform those of waht the app is capable of. I have in no way, shape of form been contacted by Loopt prior to this review. 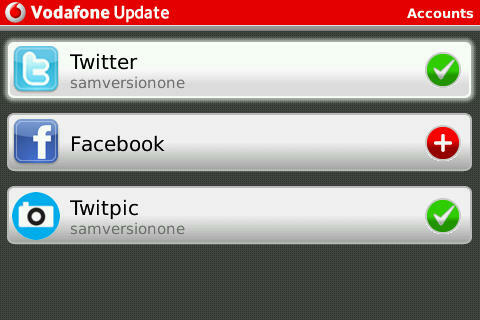 « Quick Review: Vodafone Update Twitter/Facebook App for BlackBerry.